Jenny Dewey in front of the Chico Locker & Sausage Co. Inc.
We LIVE there for we LOVE. We fight for peace and we die for freedom, but is fighting really the solution? The more I educate myself about the source of MEAT, the more I realize fighting for the truth is getting me nowhere. Thankfully butcher Jenny Dewey has taught me that my greatest weapon is always going to be information. This combined with passion and the desire to share that information with people that are willing to listen could be the foundation to a movement in the right direction. Fighting people that don’t want to listen never results with a world filled with happiness. Education may just be the key to our evolution. A goose that has been hunted by Jenny's brother and father. Part 2 of my personal quest takes me to the Chico Locker and Sausage Company Inc. After seven and a half hours of driving I finally arrived in the small, rain soaked town, of Chico California. All the homes are of a Victorian or Craftsman style. If I did not see the modern cars I would think I was somewhere in the early to late sixties. I made a quick stop at the Roost Café, where it looked like Norman Rockwell left his last paintbrush. I filled my stomach with food and went straight over to Jenny’s butcher shop and deli. The dining part of the deli. This is my first time in a small town. I grew up in Los Angeles constantly surrounded by tourist, seeing the same person twice is rare. I am lucky to know my neighbors let alone seeing someone at a local butcher shop. I pulled up, saw Jenny in the window, and right away she knew who I was. I grab handfuls of gear and headed inside. Jenny, looking stressed, says a quick hello and quickly introduces me to the rest of her family and just as quickly they are back to work. Jenny shakes out the rain from a drenched Chico. Some of the many spices & BACON makes everything BETTER products sold by Chico Locker. She quickly showed me the back of the shop, the locker where they hang their carcasses, the boxes for the custom orders, and where they grind up all their sausages. She shows me their newest machine which can process up to 100 pounds of sausage in as little as 15 minutes. This task used to take them 4 to 5 hours to complete. I quickly waved to the rest of the employees who only had the time to look over their shoulders, smile and say hello. Jenny prepares to fill a custom order for a customer. Jenny is right back to where she left off and I am on my own. I stay out of the way as much as I can, but in such a small space it is literally impossible and it has been this way since 1965. Just think how many foreheads have been wiped? How may hours have been worked? How many tons of food has been put on plates? God knows how many people have been feed since this place has opened. They offer a variety of jerky and peppers sticks. Butchery is a skill I am still learning to appreciate. Jenny’s Grandfather (a Master Butcher) has passed his craft down from generation to generation. I had no idea what this craft is until I saw Jenny slice into a piece of beef with her steel sword. I have never seen a perfect slice of meat crest over like a wave onto a cutting board. It takes years to master and every cut is different. Customers relax and enjoy the Special, Smoked Tri Tip sandwich. Jenny and her family work 6 to 7 days a week, 8 to sometimes 12, 15 hours a day. They been working this way their entire life and vacations are rarely, if ever heard of. How could someone dedicate an entire life to MEAT, Jenny gave me a chance to ask a few questions and find out. PLEASE NOTE: Employees where requested to remove any head ware for the purpose of photographs, this is not common industry practice. Carcasses hang as they age in the meat locker. 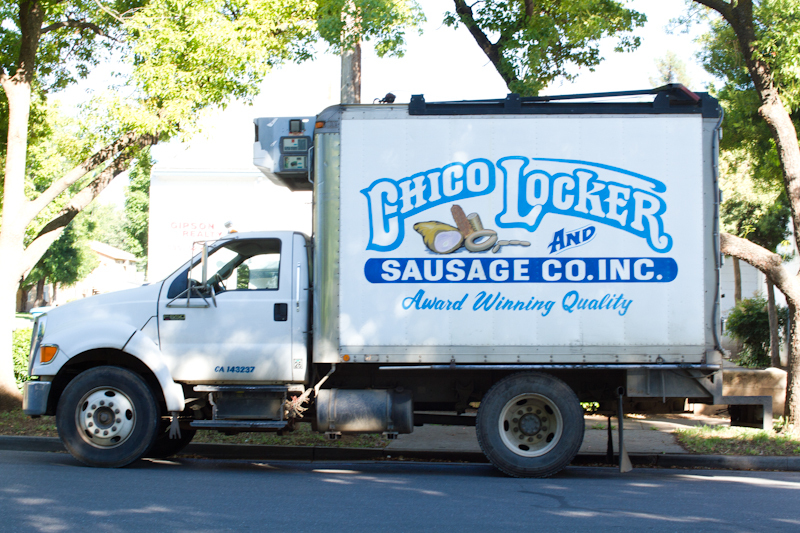 MEAT ME: So what is the Chico Locker & Sausage Co. Inc.? How did it start? Jenny looks for the hog of a customer to prepare for a custom order. MEAT ME: When did you first get into it? Jenny: (laughs) My coworker jokes that I was born into this and essentially I was. I was basically raised at the shop. We have photos of me in a playpen in the deli while my mom is making sandwiches. Many of our long time customers have seen me grow up there. They have memories of me in a baby carrier asleep on my father's back while he is hand-linking sausage. I have memories of being a kid there while Dad and Mom are working, Jake (my brother) and I built forts out of the boxes or played store in the deli. That place literally is our second home; I've spent so much of my life there. We always used to joke when I was kid that wherever we were in town, going to dinner or something, that we "ALWAYS had to stop by the Locker". I started working in the deli and running the register when I was 13 on the weekends and during summer. In high school, senior year I only went to school for a half day, and you bet that afternoon I had to show up for work at the shop. And in college, on days I wasn't at school, I was working at the shop. It kind of started from there and now I can basically do everything. It's a unique experience working for your family, in some ways it's one of the hardest things you'll do, in some ways it is easy. But I feel so blessed to be able to be working next to my father, mother, and brother in a business that my father and grandfather has put their blood, sweat, and tears into building what it is today. Jenny's father David Dewey sharpens his blade before beginning to cut meat. MEAT ME: What is your role at the shop? Day-to-day? Jenny: Our shop is very different in that we really don’t have set roles. Our shop is small so the people that work for us have to be able to do a lot of different roles. Because we are so small you’re required to have more knowledge and not do the same task every single day. We are all constantly learning and adding knowledge to our repertoire. I guess when I have to qualify myself I would consider myself the assistant manager of the shop, but I could also be considered a meat wrapper, sausage maker, deli clerk, etc. Basically if there are any problems or any questions, and my father isn’t there, I am the one dealing with all those things and being required to make "executive decisions" as we like to call them. MEAT ME: What would you say is your specialty or talent in this business? Jenny: My specialty has evolved into making sausage. I am the one responsible for figuring out what needs to be made, specifying the meat block (how much meat goes into the batch), weighing the spices, and mixing the meat and spices. We have a book that we call "the Bible", it carries all of our recipes and formulations in it. I have gotten to point now where I hardly have to consult it. I know them all by memory, for the most part. When we have to make sausage, we all know our roles in the process, which increases our productivity and makes it easier on all of us. Sometimes I am amazed at how much product we can turn out in a short amount of time. MEAT ME: Have you guys ever thought about putting this “Bible” out there and publishing it? MEAT ME: What is custom processing? What types of animals do you process? Jenny: As far as our custom processing goes, we slaughter (yes I said slaughter!) beef, hogs, lambs, and some goats. Which is what the shop was originally known for. What custom exempt processing entails is we have a mobile slaughter truck http://chicolockersausage.files.wordpress.com/2011/07/img_47733.jpg which goes out to the farm or ranch and slaughters the animal right there, on site. Now some people may gasp at this. But let me tell you, what my father does is an art. He has done this for nearly 45 years and is an expert at what he does. His conditions are not a sterile slaughterhouse but there is no denying that his carcasses are clean and free from manure, dirt or debris of any kind throughout the process. And he is the ONLY one that sees the carcass from start to finish during the slaughter process. How many of you can boast that about your meat? http://thebeefjar.com/2011/07/13/wordless-wednesday-a-beef-harvest-2/ He then transports the animals (in the refrigerated truck) back to the shop. 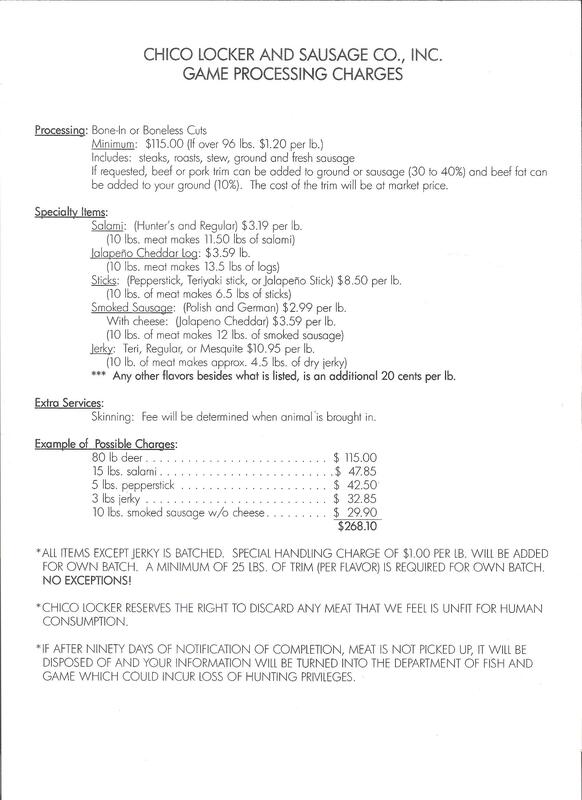 According to the law, custom exempt means our shop "can only slaughter and process livestock for the exclusive use of the owner(s), the owner’s family, and non-paying guests". The meat is marked not for sale from start to finish. Carcasses are stamped Not For Sale, packages are labeled with Not For Sale. It cannot be resold once it is processed and packaged. Blaire wraps some Deer Snack Sticks. MEAT ME: So what is the process that beef might go through in your shop? Jenny: So my Dad goes out and butchers the beef. We hang our beef in quarters. Normally they are hung as halves but we don’t have the 10 feet high rails to do that. Our beef carcasses hang in the cooler for a minimum of 14 days. This is called dry aging and I wrote a blog post on it, you can find that here: http://chicolockersausage.com/2012/02/03/fun-meat-fact-friday-aging-beef/ It can hang longer (up to 30 days), but it depends on how large the carcass is and how much cover (fat) it has on it.. We even have some customers that specify how long they want it hung, otherwise we use our expertise on judging when a beef is ready to be cut. After the beef is aged, it is rolled out and the processing begins. On a whole beef, there are two front quarters and two hindquarters. Our meat cutters (butchers) then begin what’s called "breaking" the carcass. This basically means that the beef is broken down into manageable pieces called primal cuts, which will later be cut into steaks, and other cuts. I actually wrote a guest blog that explains everything could you have ever wanted to know about cutting a beef up including photos. Please check it out if you are interested, it's seriously like a semester of meat cutting in one post. http://thebeefjar.com/2011/07/25/guest-blog/ The beef is cut exactly to the customer specifications. My mother takes most of the orders so she’ll call up the customer over the phone and discuss the cuts, thicknesses, and exactly how they want it. If they want their steaks 2 inches thick, they get them 2 inches thick. All of the cuts are vacuum packaged and labeled with the customer's name as well as NOT FOR SALE. It goes in boxes with the customers name on it, usually it will freeze over night. The customer picks it up within the week, takes it home, and on the table it ends up, nourishing their family. Really if you are concerned with where your meat is coming from, custom processing is where to go. Purchasing a half or a quarter of a beef can really be an investment and rather costly, but in the long run it is cheaper than purchasing all of those cuts from the grocery store or butcher shop. And it will feed your family for the year, all from one animal. How much more transparent can it get? It is literally Moo to Mouth. Jenny take a custom order from a customer. MEAT ME: You mentioned previously, you do game processing. What types of game do you process? Jenny is cutting a Chuck roast for a customer in the deli. MEAT ME: What type of regulations and rules does your shop have to follow? Jenny: We are under an inspection classification called “custom exempt” One of the main ways that custom exempt varies from USDA is that when my father goes out to do a slaughter he does not have an inspector with him. It is his responsibility to maintain good quality and follow the safety standards. He is required to go through an annual licensed processing inspector course every year. He has to do that in order to stay open for business and do custom processing. What that title also requires is to maintain records of where the animals came from, where the meat is going as well as daily checking our facility for cleanliness, appropriate employee habits, and other food safety standards. Everything is documented and double-checked by our inspector. We have an inspector who is a State employee; he makes sure we are complying with all regulations. He comes unannounced and goes through the plant making sure that everything runs correctly, that there is no cross contamination with products, things like that. He then checks all of our records. He can write us up for anything that needs to be redone. All inspectors have been trained extensively in food safety standards and how to prevent food born illnesses so having that inspector coming in is a great source of knowledge for us on the new advancements and protocols for the industry. He is also there to make sure our retail side is being run correctly. We have to extensively document every product that is made and run through our smokehouse, specifying how much was made, making sure it made it to the appropriate temperature to be fully cooked, etc. He checks all of these documents as well. His department is also in charge of approving labels. For example, when we want to come out with a new product with an ingredients statement it has to be approved though him. He has to see the recipe and make sure that all of the ingredients that are going in it are approved food ingredients. Dave checks in with Jenny to see if see needs help with an order after he has just come back from duck hunting. A boneless ribeye butterflied makes a beautiful heart for any meat lover on Valentines Day. Blaire cuts a bottom round for Carne Asada on a custom beef. MEAT ME: What are the different types of meat sold in your shop? Jenny: We sell commercial meat. I think sometimes people get confused about what kind of meat we sell. All the meat you buy in our store must come from a USDA inspected slaughter facility, that's the law. So all the meat we sell in our store, we did not slaughter ourselves. But it came from somewhere that slaughters under the classification of USDA inspected, which allows us to purchase that meat and resell it in our shop. We offer all choice or higher. If you aren't familiar with quality grading, I wrote a blog post about the difference between quality grades which you can read about here http://chicolockersausage.com/2011/12/16/fun-meat-fact-friday-quality-grades Most of our boneless steaks are cut to order (filets, new yorks, rib eyes, top sirloins). Rarely do we ever buy anything pre-cut. We like maintaining control of how our chops or bone-in steaks are being cut. Most all of our products like sausages, salamis, lunchmeat, hams/bacons are made by us. For example, we don't buy in hams or bacons. We buy in fresh pork bellies and legs and cure and smoke them ourselves. Same with our sausages, we buy in the pork shoulders, grind them, add spices, and stuff them ourselves. Jenny's brother, Jake, and butcher, Ken make snack sticks. Sometimes I don't think people realize that the majority of products we offer are made right there on the premises. We don't have an off location, it's all done right there. You can even come up and watch us. We love being able to give "tours" so to speak, especially to kids. They love it. If there is something you are looking for specifically and don't see it, ask us! We can order in a lot of specialty products. However, when your interested in a specific type of meat, you really need to do your research and find out what makes it that specific type. Don't rely on marketing alone. The grass fed movement is becoming really, really big. We carry a grass fed product from Pacific Pastures. The best way to link people up with a product that is natural or grass feed is connecting them to people like Megan Brown http://thebeefjar.com/ or other farmers and ranchers. Through them, customers can buy specific animals and then have them processed through us. We act as the intermediary between the two. They purchase the animal directly from the farmer and rancher and then we simply process it. And again, that is truly giving people the Moo to Mouth experience. As the Mercedes (their Handtmann Stuffer) pumps out the snack sticks, they are cut and hung to be smoked. MEAT ME: What is the future of the meat industry? Where do you see yourself in 30 years? Jenny: I would love to continue doing what we are doing now. We really provide a specialized market through our custom processing. There are people that my father has been butchering forever since he was 16 and we still butcher for them, or we butcher for their children or even their grandchildren. To cut that out of our business would be a really tragic thing. On the other hand, cutting meat from a carcass is becoming such a lost art. It is so hard to find people that know how to break carcasses and know how to break them down into those primal cuts. It is even harder to find people that can butcher and butcher well. There are a lot of people out here that run mobile slaughter trucks and butcher but their quality isn’t very good. It is not up to the standards that our business requires. My dad learned from people who are no longer with us and that skill has not carried on. The tradesman of being a butcher is not very popular today. Grocery stores and most retail stores do not cut from the carcass, they cut from meat from a box. The fact is that it really isn't cost effective and very hard to use up the whole carcass in a retail setting. It takes some very creative marketing and promoting to be able to use every bit of it without experiencing huge losses. So in the retail market, everything comes in a box. Those primal cuts are already broken down. So now meat cutters only need to know how to trim it, make sure that it is free from gristle, and free from some surface fat. It has been hard for us to find people to work for us that have experience in the industry. It is going to get even harder unless there is a big movement in to butchery or old-fashioned ways of doing things. I am not sure what the status of that would be in the future. If we had to cut that out I would have to double our retail and possibly expand, have a larger meat case, more varieties of sausage. We would start making more specialty items that we get people asking for. We have people that come out here from the Midwest and the East Coast and they ask for products like bockwurst, pâtés, or loafs. Those are things that we don’t make and would require additional machinery to make. Right now we don’t have the space to do that but if we were to expand we would have be able to invest in machinery that makes it's possible to make some of the German specialties. That would be something I would look forward to. As far as how our game processing goes, if we were not doing any processing, there would be no reason to staff butchers or meat cutters. So we would offer to make game products but you would have to bring your meat into us already processed, boneless and we would make what ever you would like. That is a huge market for us and I would love to continue providing that specialized service. Customers look in curiosity as their order is being filled and a master butcher is at work. MEAT ME: Would you say that the AG Meat industry is predominately male? Jenny: In shops like ours? Probably. If you go into a big packinghouse or slaughter house you would actually be really surprised at how many female employees they employ. However, those are mostly based out of the Midwest. Packing houses provide jobs for quite population of people and just like a car manufacturing plant, you have male and female. As for small shops like ours I would say, the majority of female employees are more than likely daughters or wives. In the field of meat cutting women are extremely rare in small shops. I really only know of one lady and she is a female butcher. Jenny slices Carne Asada for a customer. I only think that it is because some of us are limited in our size and capabilities. For example, a beef carcass weighting 800 pounds contains a chuck (primal cut) on it weighing about 80 pounds or more. It is heavy for a woman to break that off and put on a meat block or band saw. That might be one of the reasons why women typically aren't employed as butchers. But that's not to say that you couldn’t do it if you didn’t have the tools, you would just the correct set up. Being involved in the American Association of Meat Processers, I have been able to meet other women getting involved in the industry and working in the field. I think now more than ever there are more women working in this business where as before it was more male dominated and I hope more people, especially women, start getting interested in working in the MEAT business. In fact, there are some exciting advancements for women I know in the industry, there is a women currently running to be the president of our national association. If she gets elected she will be the first woman ever to be president of the association. I am really pulling for her, not only is she a good family friend, but we also share a lot of the same ideas about being involved in empowering women in the meat industry. Jenny tends to a customer as the child interacts with the deli clerks. MEAT ME: You would recommend other women to get involved in what you do? Jenny: Absolutely! I'd love to work with more women in my field or even my shop! With so many great choices a customer takes his time ordering exactly what he wants. MEAT ME: So how would a woman who loves meat and wants to be a butcher get involved in the industry? Jenny: On a local level it is really hard to get involved. It’s the same for men. We have people that want to work for us, we ask them if they have any experience in the meat industry and they say no. We are busy, we have a lot to do and we really don’t have the time to train people with NO experience at all. Which is unfortunate, we would love to be able to. As far as in our own shop, we would like people to have some base knowledge. They offer courses at the local college on meat science. Take a meat science course so you can at least have the basic knowledge before you go and get into butchering since it can be a very specialized field. It is not like you can start running a restaurant without knowing anything about it. It takes time to learn it. One of our employees has been working with us for 5 years and she is still learning things to this day. We do so many different things I am constantly learning; she is constantly learning it is just so vast. I recommend taking a course, taking a workshop or going in and talking to your local meat shop. You could start out doing something as simple as cleaning at night or being a freezer person. Then maybe move up to wrapping meat. Wrapping meat is a very common skill in the industry. That is where I started and now I do more. It is a fairly simple task but you need to be able to identify cuts of meat, you can’t keep asking cutters what is this or what is that, especially when we are at our busiest and cutting 20-25 hogs a day. It is a lot harder to get your foot in the door in this industry but once you get in, the opportunities are endless. I know many women who write for Meat industry magazines but they still have to have that base knowledge. There is a huge need for female inspectors for USDA and state inspectors as well. That requires some training and schooling but the field is still wide open. Jenny carries a heavy custom order out to their truck. MEAT ME: What is it you love about what you do? Jenny: My favorite thing about what I do is that I love being able to teach people. I love when people come into my shop and they are talking to me about meat and they quote some misnomer or some myth. Or they really aren't educated on what it is that we do. I like when I can be able to tell them, that's cool that you're interested in this and hey, here's what we do! Here's the real story. Even better when I can take them up and I can show them, look this is what we do. Here it is. This is how it happens. I can share with them that knowledge then they can go out. They can share with their family, their friends, whoever it is that they are talking to; and they can give correct information, or they can link to our blog. Something like that. I really like being able to share that this is what our family does. This is what my dad has been doing for 45 years and now I am involved in it, my brother is involved in it. Show people this is our livelihood, so when you're essentially trying to bash the meat industry or put a bad spin on it, that if we didn't have our shop, we would be out of work. We wouldn't be feeding our family, we wouldn't be feeding other people's families. We wouldn't be feeding our long time customers that have been coming to us for 50 years, 40 years. They would be out food as well. So when you're hitting a local business like that, it's really a big deal. And a lot of times when I show people this is what we do, they really had no idea that's how it was. They like the idea that my family are the people that are doing it. We are reaching out to them, we are giving them information. And we aren't afraid to show what it is that we do. We are transparent, and we like that. And that's probably my favorite part of my job, being able to share that transparency with people and being able to share that knowledge. Jenny gets ready to close up shop for the day. MEAT ME: What is your favorite type of MEAT? Jenny: I am just going to put this out there and I keep saying this but short ribs are like heaven! You have to know how to cook them. They have to be cooked for a long period of time much like a chuck roast. But they are worth it and super easy to cook! The Pioneer Woman http://thepioneerwoman.com has some amazing recipes! I'd say that cooked correctly I'd take short ribs over a filet steak. There you have it, straight from a butcher's mouth (laughs). Filets are good but they cost a lot more. If you’re looking for something cheap, delicious, and you've got time to cook them, short ribs are it! I would like to Thank Jenny and Chico Locker for having me out and showing me and you their amazing family owned operation. categories: "Butcher", "Chico Locker n Sausage Co.", "Jenny Dewey", "Meat: A True Love Story", "Moo to Mouth", "\"how beef gets to the store\"", "meatmeblog"